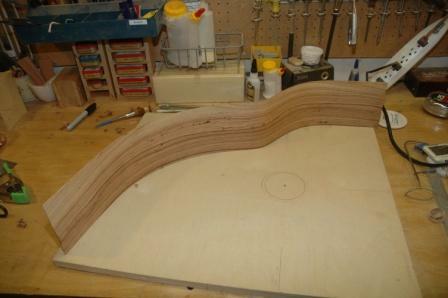 The first bent side is out of the bending machine. 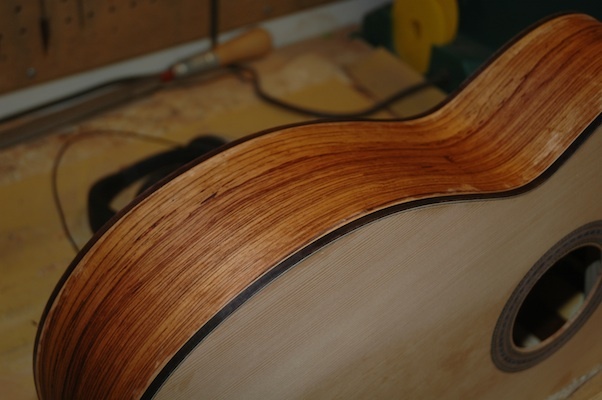 The resulting bend is accurate yet not tight enough. 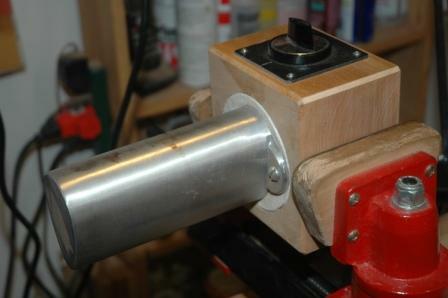 I’m resigned to the fact that I also need to apply more bend with the bending iron. 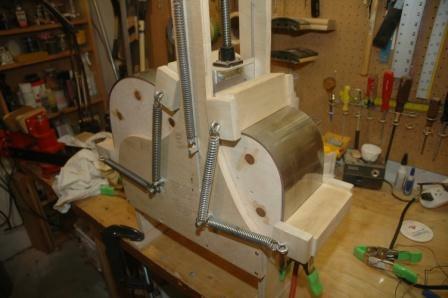 I’ve had limited success with the bending iron, mostly due to wood being too thick and preloaded with tiny cracks. 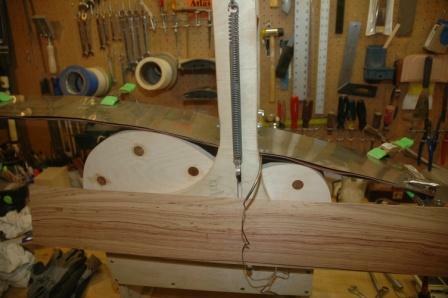 The machine bend of the first side did produce two minor cracks, which I filled with CA glue. 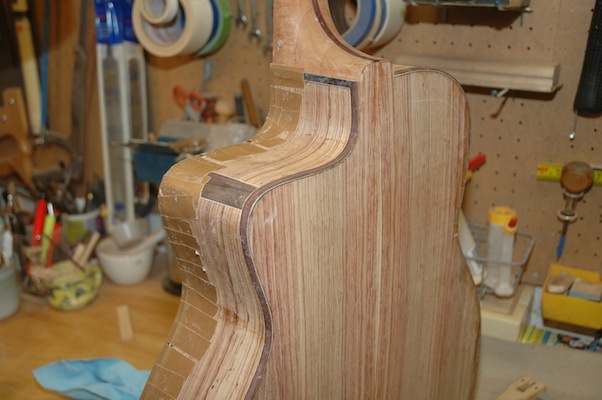 I took a first pass attempt at increasing the tightness of the bends with the bending iron, and found I could make some headway on tightening the bends and not introducing new or wider cracks: all due to the nice .070″ thickness of the sides. 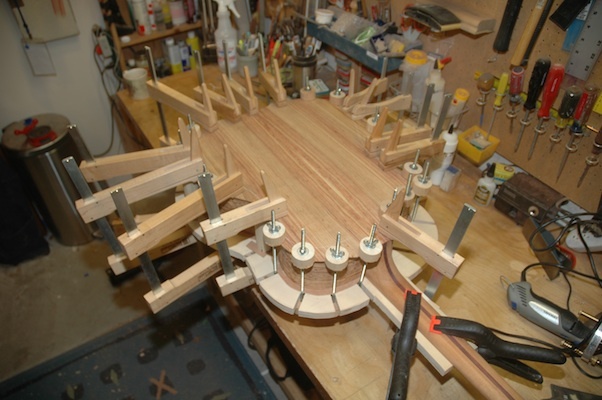 I will complete the hand bending just prior to installing the sides onto the work board, which is still under construction. 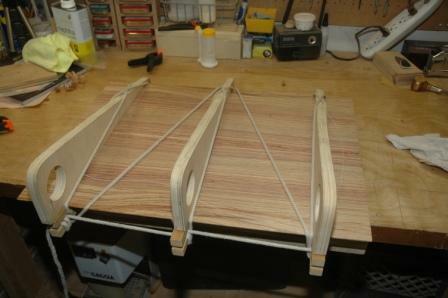 The workboard will be finished with sliding cauls along the outside border of the sides. 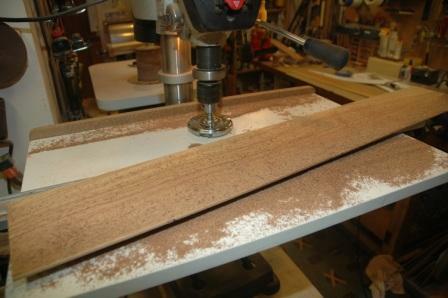 The sliding feature will allow me to use this workboard for dreadnoughts, OM’s and this Macaferri style body, along with others in between. 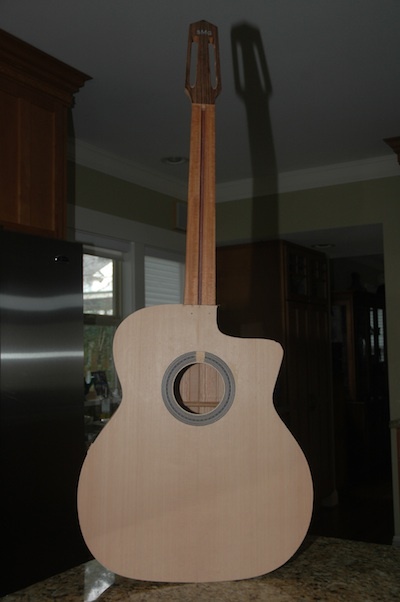 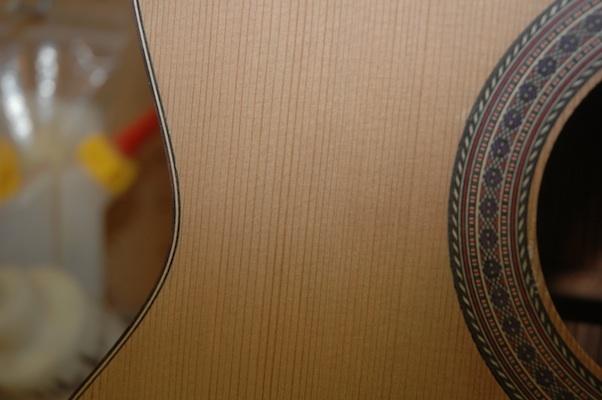 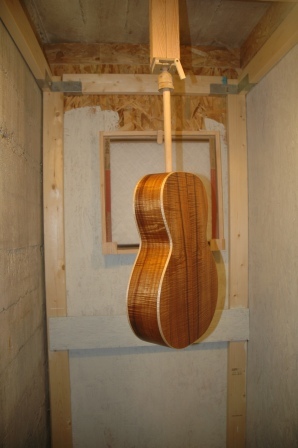 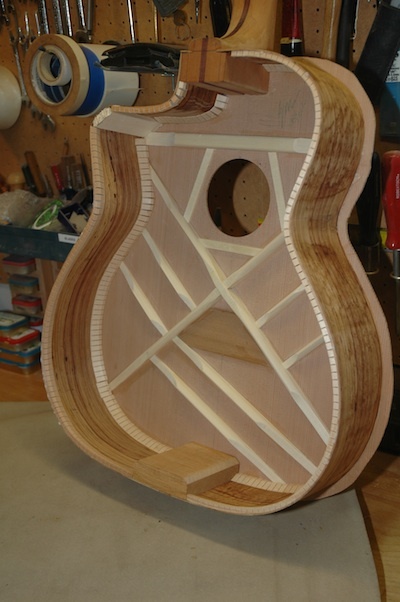 I usually build in a mold, which is only appropriate for guitars with dovetail or mortise/tenon bolt on necks. 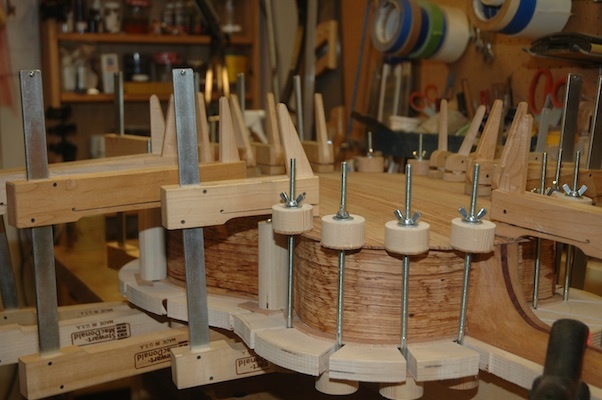 The workboard is necessary for the spanish heel type construction. 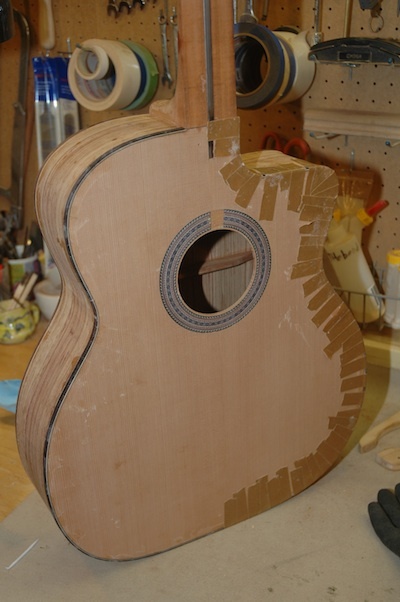 This will all become obvious when I get to the step where the sides are glued to the top which has been attached to the neck. 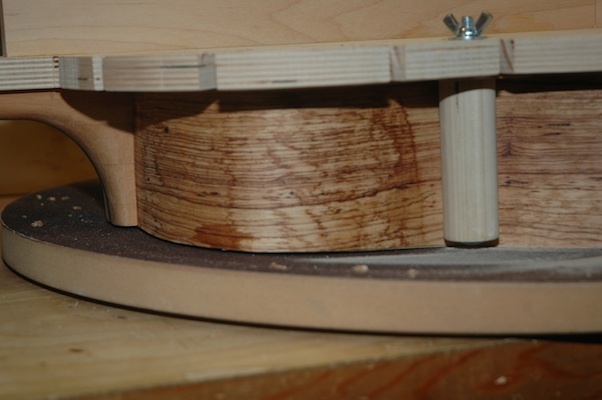 I will have to provide a small radius bowl in the lower bout area of the workboard to accommodate radiussed X bracing. 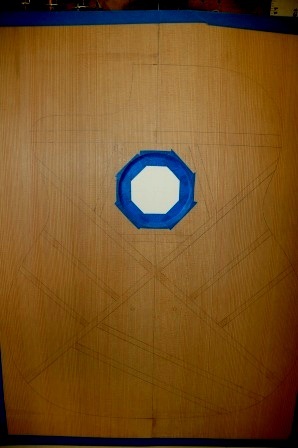 Palo Escrito is a pleasure to work with. 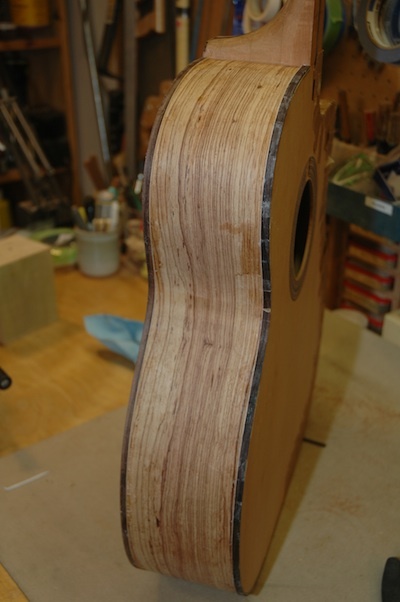 I first planed the sides down to about .075″ with the Safe-T-Planer then passed them through my newly repapered drum sander to smooth them and bring down to .070″. 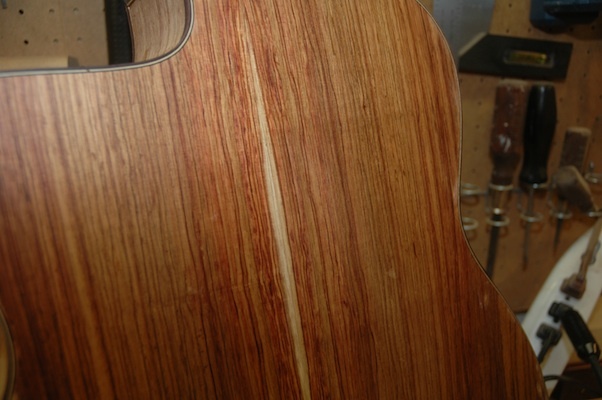 This is very thin, but not so for a cutaway bend. 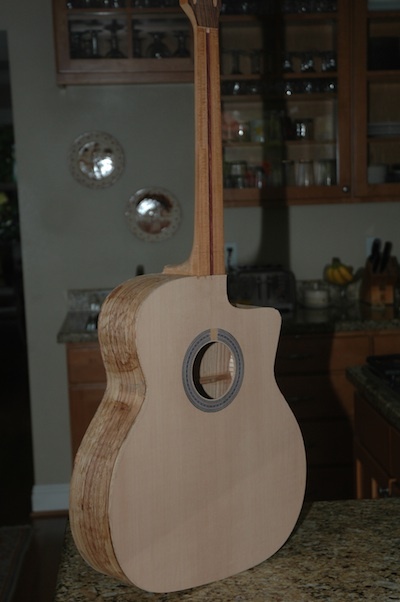 I bent the non-cutaway side first to practice bending this stuff for the first time. 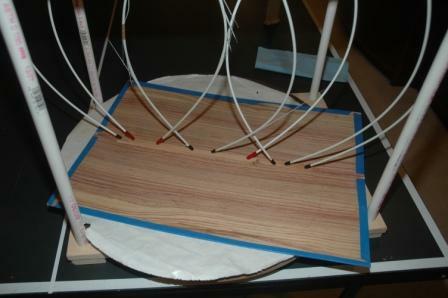 This photo shows the setup before plunging the waist press, then drawing the spring bars down across the bouts. 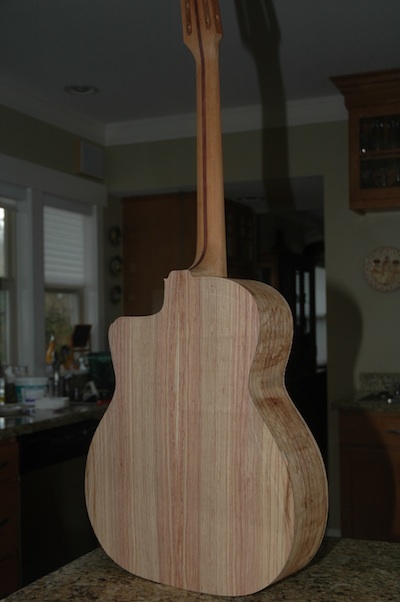 I’ll let this sit for a couple of hours, reheat then let sit overnight. 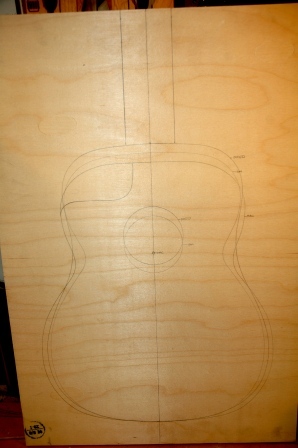 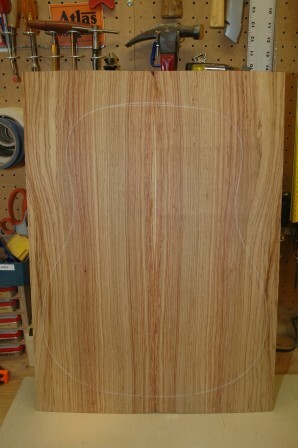 Using the same setup for planing the uke sides, I brought these sides down to .070″ in preparation for bending. 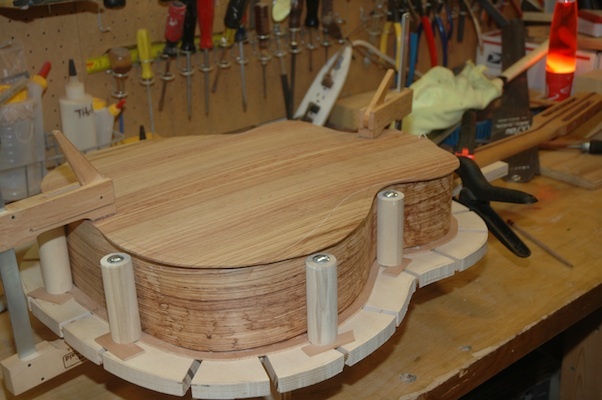 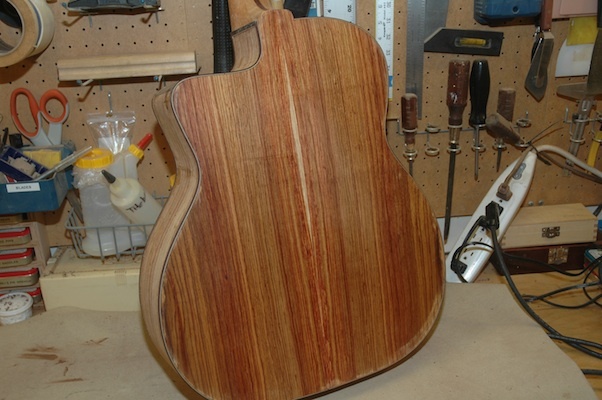 I’m tempted to thickness the cutaway side even more, as there is a sever bend in the upper bout. 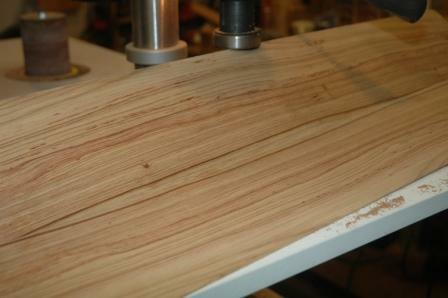 Both sides will go through the drum sander tomorrow to clean up the planer marks left behind from the Safetee Planer.